As the lightning crackled around a nearby a major manufactured housing factory, a group of American utility folks touring Japan this week learned Monday about the appeal of PV in this island nation. The Solar Electric Power Association group spent the afternoon touring the Sekisui factory in Saitama outside Tokyo. Here is the deal. The company started offering consumers the option of buying prefab houses with photovoltaics on the roof in 1999, and they promptly sold 5,000. Now the PV option is selected by a whopping 78 percent of the company customers. That is roughly 7,800 of the 10,000 units a year that they sell. 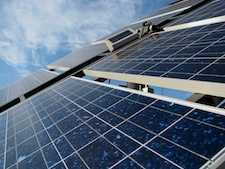 The PV option tacks on about 9 percent to the cost of the home. The Japanese government is banking on successful companies like Sekisui to drive the adoption of solar throughout the nation of 120 million. That is what one prominent national government official, Shoji Watanabe, told the group. He carries the long title of director of the new and renewable energy division of the powerful government agency, the Ministry of Economy, Trade and Industry. Somewhat sheepishly, he told the SEPA delegation that the deficit-haunted Japanese government has earmarked 134 billion yen for renewable deployment and research and development. Roughly, that is about $1.5 billion, a paltry sum when stacked against the Obama administration efforts to use energy investments to create jobs and stimulate the US economy. I asked Watanabe if Japan should be doing more. A most difficult question he responded to the group, and to me privately, after our meeting. “We expect the private sector to step in,” he said. And Sekisui gets the message.